Hotel Deoki Niwas Palace Jaisalmer, Deoki Niwas Palace Hotel Jaisalmer, Reservation for Hotel Deoki Niwas Palace, Jaisalmer, India. Address: Opp. Kishan Ghat Prol, Jethwai Road, Jaisalmer - 345001, Rajasthan, India. Accessibility: 2 kms. from Airport, 1 kms. from Railway Station, 1 kms. from Bus Stand. 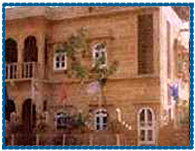 Hotel Deoki Niwas Palace is situated in the heart of the Jaisalmer, very close to the famous Jaisalmer fort. 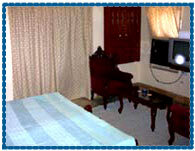 Hotel provides a very comfortable and luxurious accomodation with all the modern amenities for a memorable stay. Hotel offers 12 well appointed luxurious rooms equipped with modern amenities for a comfortable and memorable stay. Room Service, Running Hot & Cold Water, Telephone, Television, Safe Deposit, Golf on Sand Dunes, Banquet & Conference Facilities, Doctor on call, Money Changer, Travel Desk Service, Laundry, Camel/Jeep Safari, Gala Dinner on Sand dunes.